We thank God for your partnership in sending gift-filled shoeboxes to children in need around the world! Together with local churches worldwide, Samaritan’s Purse has delivered 146 million Operation Christmas Child shoebox gifts since 1993. Your service at a drop-off location is an integral part of giving millions more children the opportunity to learn about the Gospel of Jesus Christ! 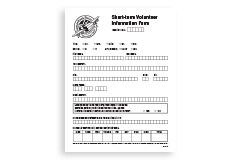 Please download, complete, and print this form. Be sure to bring it with you when you serve. We’d love your feedback regarding your service at a drop-off location. Interested in volunteering with Operation Christmas Child year-round? Positions are available in Leadership, Church Relations, Logistics, Community Relations, Media Relations, Prayer Mobilization, Administrative Support, and Student Relations.